The raining season has started here. And with the days getting cooler, I have made these blouses for my girls. Do you like them? Are you keen to get some for your girls too? If you are interested, I can make them for you at a fee in the colour you want, subject to availability of stock. 1. Romantic Cape bolero – USD25 for one tone. If you want two tones like the one I did here, add another USD5. Colours used are #11 [main] and #10 [border lace]. 2. Little French Cape Blouse – USD20. Colour used is #8. 3. Cap Sleeves Blouse – USD24. Colour used is #13. This period is for you to place your orders and make payment. After the end of the period, I will consolidate and purchase the yarns and start work on order fulfillment. I will reopen for order again later. Please look out for it if you have missed this round. 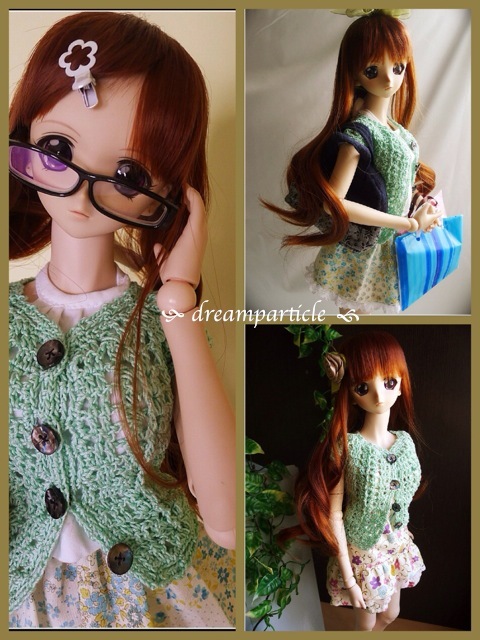 a) Prices listed are for the crocheted blouse/bolero and buttons only. Postage/shipping and doll etc are not included. b) Email me at dreamparticle@gmail.com stating how many pieces you want, which style and what colour. It would be better if you can state your choice of three colours in the order of preference. So that if your first choice is out of stock, I would try to get your second choice and so on. E.g. 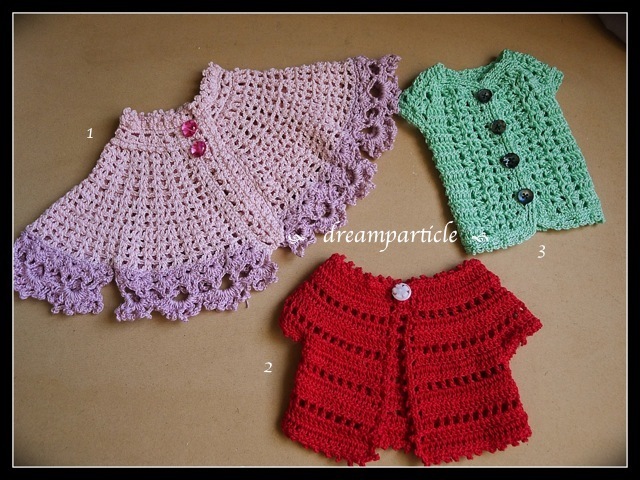 Order: 1 piece of style 1[Romantic cape bolero] in the colour order of #3, #15, #7. This means, I will get yarn #3 if there’s stock else I will get #15 and so on. And the bolero will be one tone. E.g. 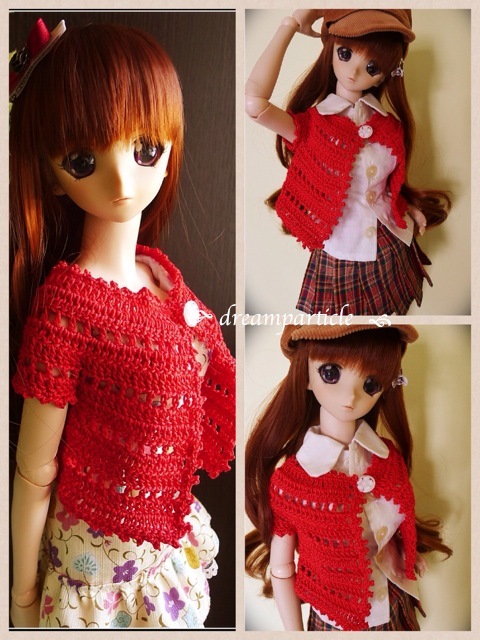 Order: 1 piece of style 1 [Romantic cape bolero] in the order of #3 [main] + #4 [border lace], #15 [main] + #12 [border lace], #5 [main] + #2 [border lace]. Likewise, this is for the bolero in two tones. I will get #3 and #4 when there’s stock and so on. c) I will need about ten to fifteen working days to work on your order. Because I will want to wash and air dry the blouse before delivery, I will let you know if more time is needed. d) For international buyers, payment is via paypal (fees not included). For local customers, payment can be done via bank transfer and collection can be arranged at Tampines Central. e) Once the order is confirmed, cancellation is not possible and no refund will be given unless I can’t get any of the colours you have requested. f) These are handmade products so please understand that there will be slight differences in each piece. g) Choice of buttons will be random. I may not use the same button or colour as shown in the samples above. h) The blouses and bolero fit DD and Humming Dolly 57 (similar to Volks SD). 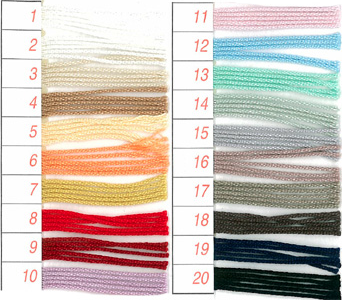 i) Here are the colour codes from the yarn supplier. Actual colours may differ with different monitor. The yarn is 100% Egyptian cotton made in Japan. It has a silk like glossy feel. The yarn price is a bit high but the yarn will give a beautiful glossy look and does not fray easily. j) For those who are concerned, this is household of non-smoking human and dog. 1) Just gently rinse them in normal temperature water will do. If need be, use a mild detergent. Leave air dry by laying it flat on table. 2) Repeated or harsh washing might cause colour to fade and yarn to fray. 3) The yarns are not known to cause any staining, however it is recommended you take the necessary precautions as I cannot replace stained doll or parts.